Mug Rug for Coffee with great Blog reading! Super simple and quick…maybe one day I’ll learn how to take the pictures better! BLOG FOR THE DAY: Check out all of the tutorials on this site! Everything from purses to great little paper pieced designs. I love the 30’s apron paper pieced design, the super cute hot pads/mug rugs and the hexagon purse. 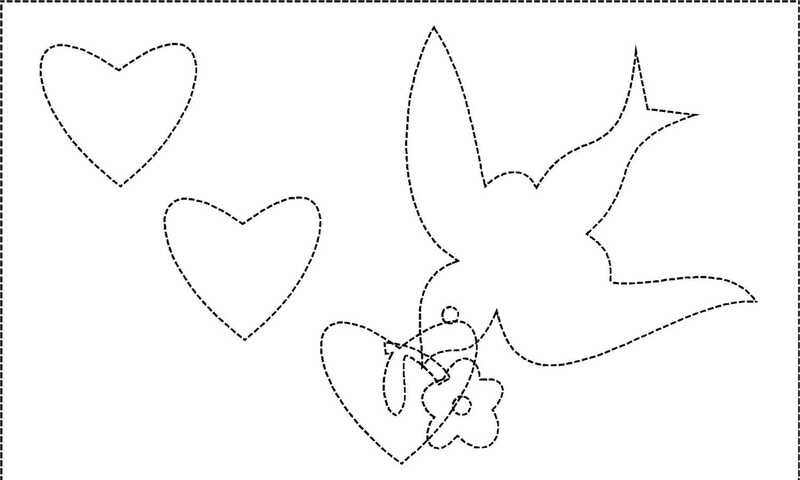 http://charisecreates.blogspot.com/:// Great free patterns, tutorials and fun little gifts to make. FUNtastic baby/toddler quilt just came off the longarm table. Sandy always does such a great job on her colors and applique. Take a look. Now, here are a few pictures of my completed Celtic Mystery quilt. Still have binding to go though. I spread it on the bed, not the greatest lighting but will show you the pattern a little better I think. Again, kudos to Bonnie Hunter! 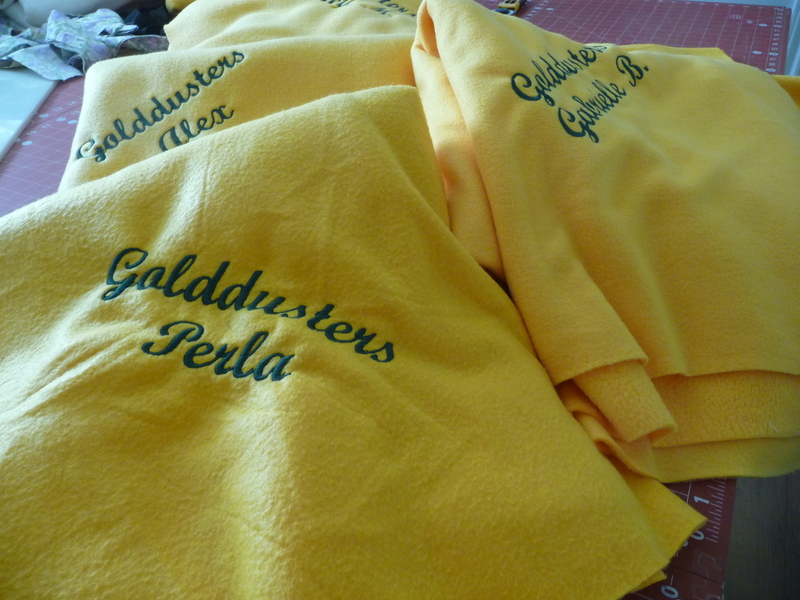 The rest of todays efforts went to embroidering a bunch of fleece throws for my daughter’s dance team – GO GOLDDUSTERS! One more row of quilting and my 116 x 116 inch Celtic Solstice will be quilted! I am so totally in love with the backing fabric as well as the border fabric! What a quilt this was to tackle but I did enjoy the process! Thanks ever so much to Bonnie Hunter for giving us this free mystery quilt. It is the second mystery quilt that I have completed from Bonnie, both Easy Street (2012-13) and now Celtic Solstice (2013-14). Check out her wonderful website www.quiltville.com . After completing my favorite thing…550 inches + of binding, this will find a home on my bed! Tomorrow the full reveal…have to go look for a way to take a picture of something this incredibly large! I ran across a wonderful blog from a blogger called “Don’t Call Me Betsy”. Her blog, dated February 10th, ” A glimpse into my Type A mind and sewing studio…” is a fantastic tale of her SPOTLESS and Oh, so organized sewing studio. Yes, I admit to being a Type A personality too but my studio just doesn’t look like this…Wish it did. Go to www.dontcallmebetsy.com and have a look. I know you will enjoy it as much as I did. Some great organizational ideas! 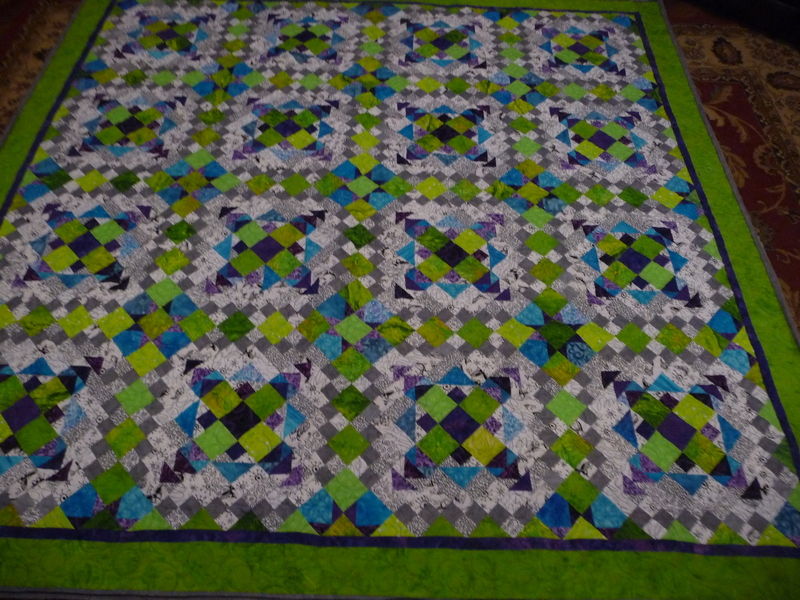 Last year’s Bonnie Hunter mystery quilt (quiltville.com), “Easy Street” has been finished for a while. 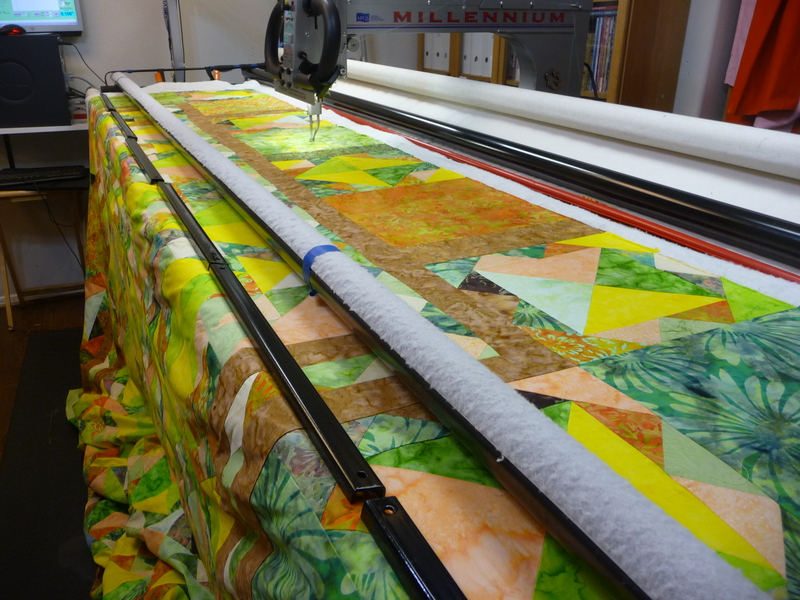 This year’s quilt, Celtic Solstice, is on the longarm machine right now. Finished at 116 x 116 it has over 5700 pieces in it! I’ll post a picture tomorrow in my Work In Progress (WIP) Wednesday. I have always been in love with the adorable little, and quick, mug rugs. I collect them in a bowl in my kitchen so that I always have something to set my coffee on in the mornings. After a long time of thinking about designing my own little rugs, I have designed my first in honor of February. Fun and finished in about an hour. Quick, easy and free!! I must be a total pinhead today because I can’t manage to upload the pattern for you onto this blog. Until I figure it out if you want a copy please just reply with your e-mail address and I will send you a black and white pattern with instructions and supply list. 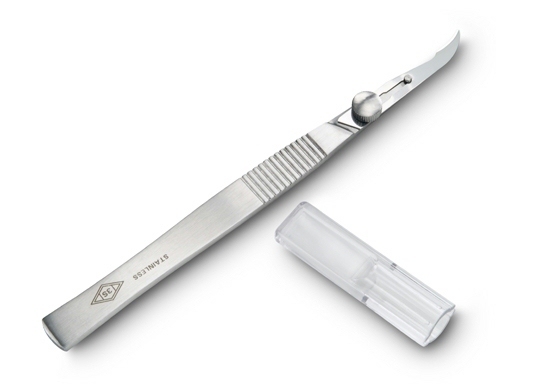 Well, its Thursday so I think Thursdays would be really good to tell you about new tools or materials etc. that I have discovered. This week I will concentrate on you appliquers! I have found, and tried, a new foundation paper for those who use a foundation meant to partially disappear when soaked only leaving the fibre content..great for giving a little dimension to your applique. It’s not really so new, I just got around to trying it. The foundation is made by Floriani and is called Stitch N Wash Tearaway Fusible. The interesting part is the fusible. It is a very, very light fusible and you MUST read the directions for it to work. Unlike other fusibles this one takes a very limited amount of heat for a very limited amount of time. You need to use the SILK setting on your iron and press from the fabric side or use a press cloth! If you heat it too much it will not stick. Be sure to follow the directions. (Ask me how I figured that out!) It feels much lighter than the Sharon Schamber paper we have been using. I cannot pick a favorite but they are definitely different. I do like the idea of not having to add that extra glue to place the template. Give it a try. 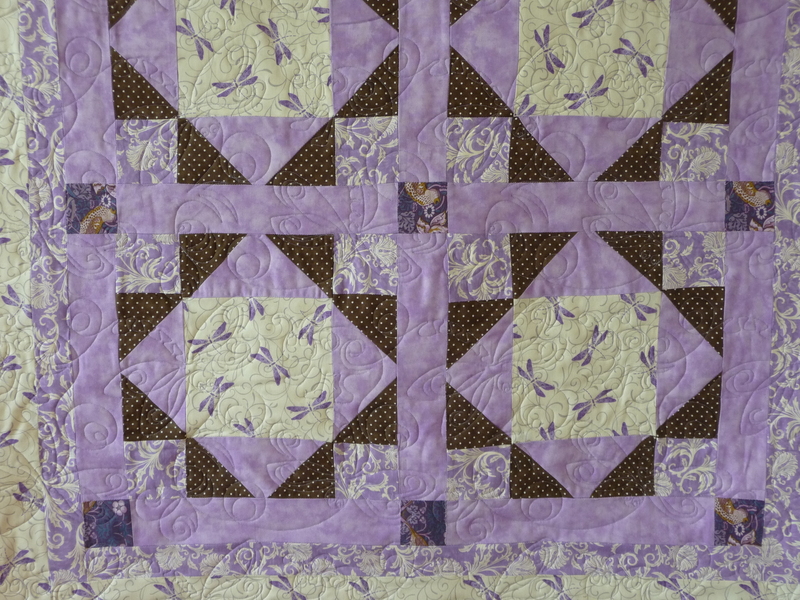 Here are a few pics of a quilt that I finished not long ago. 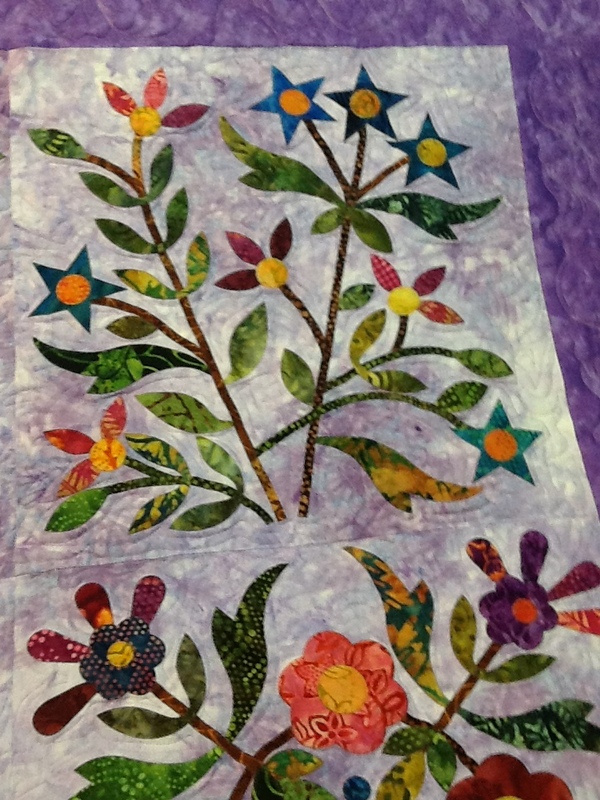 It was totally done with fusible and what a fantastic job! What a great baby quilt this is. 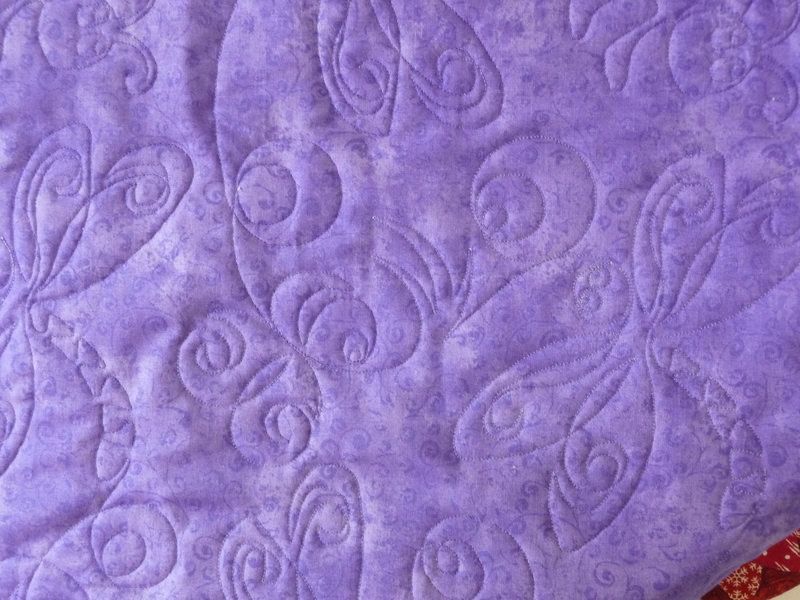 I used a whimsical dragon fly for the quilting motif and love the way it came out. Baby is due tomorrow so Grandma will be binding quickly I imagine! Great job! A charity quilt that just came off the table. Really nice, I know someone will really appreciate Jennefer’s work on this one! On the table now. A gigantic batik quilt. A great birthday present for a Bonnie’s wonderful son! He surprised her by picking batiks and bright batiks at that! Hopefully it will be finished today. 2014 QUILT SHOWS ARE “ON THE ROAD”! 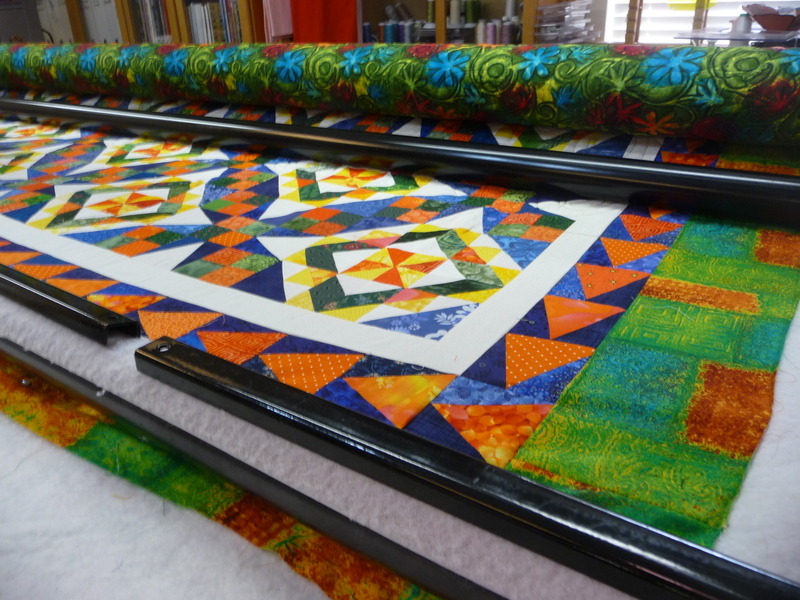 Some eye candy for today…Great quilts that recently went home to their owners…super fun to quilt! 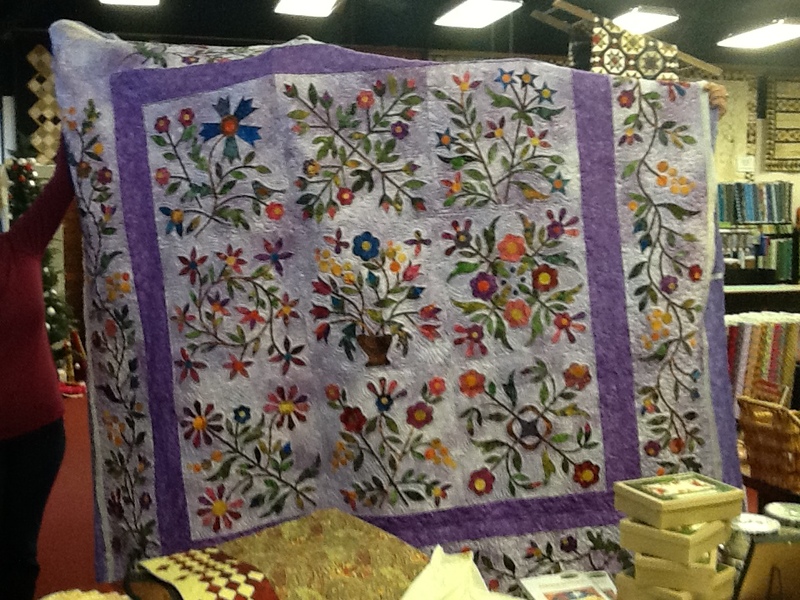 Wow, how exciting to see all of the beautiful quilts from the first big quilt show of the year, “Road To California”. I have had the chance to go to that show and truly enjoyed it! But then, how could anyone not enjoy all the unbelievable quilts set in the beautiful city of San Diego. (My favorite zoo in all the world is there too!) Check out the many winners at http://road2ca.com/2014winners/index.html Congratulations to Sharon Schamber for her fantastic applique quilt that won Best of Show! 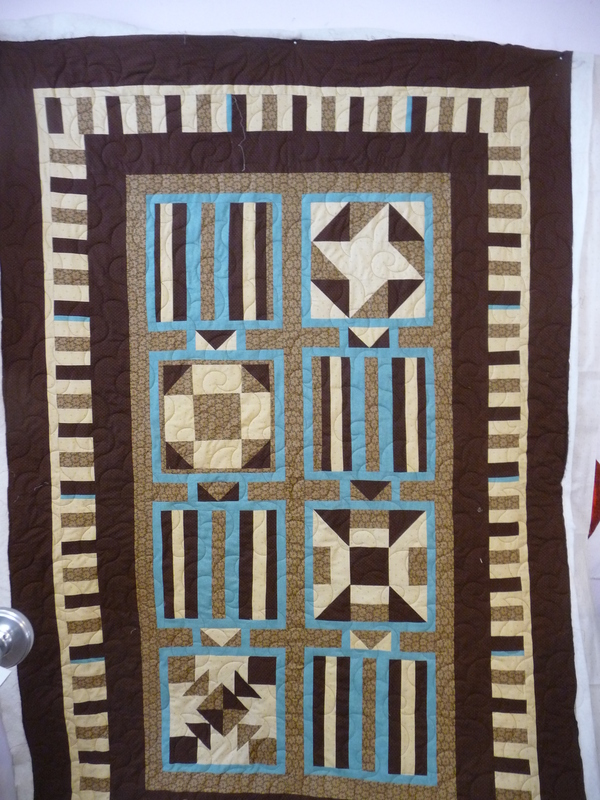 I was so lucky to see this quilt when I spent time at her Payson, AZ home. Incredible up close (and she even let her super-cute little fur baby, “Baby”, sit on it! Wow, fantastic! 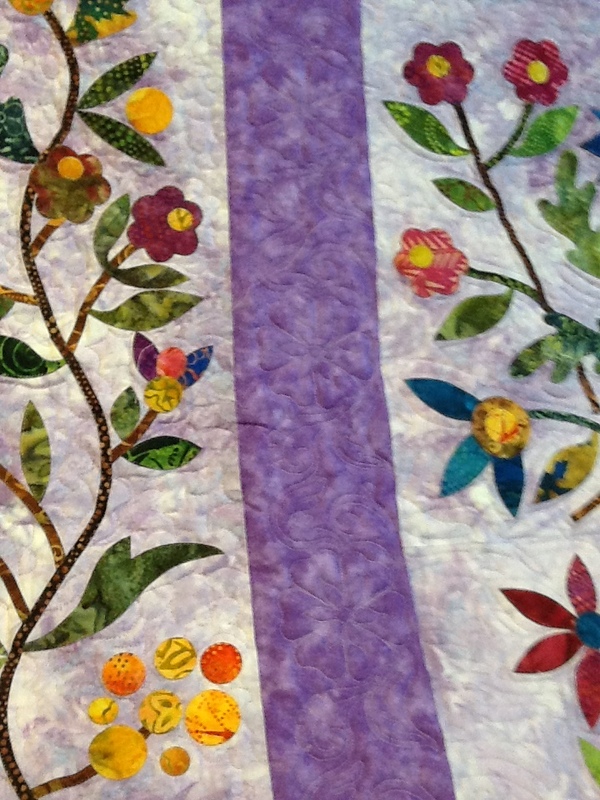 So many other fantastic quilts you have to find a cup of coffee and take a look! Enjoy!